New College Leicester awarded the Inclusive School Award for the fourth time and has now become a Centre of Excellence. New College Leicester is an improving and highly inclusive school where relationships are warm and friendly and the strong values of respect, responsibility, resourcefulness and resilience permeate. The hardworking and dedicated staff, together with the loyal support of students, parents and carers, provide an exceptionally stable and robust foundation upon which further improvements will undoubtedly be made. This school is a smaller than the average-sized secondary comprehensive. The number of pupils in the sixth form is small. The majority of pupils are White British. Nearly a tenth of the school is White European. Nearly one fifth of pupils speak English as an additional language; this is larger than the national average. The proportion of pupils eligible for pupil premium funding is more than double the national average. The proportion of pupils who are disabled and have special educational needs is higher than the national average. Fewer than nationally are in receipt of Education Healthcare Plans. The number of pupils who join or leave the school other than at the usual times is much higher than schools nationally. Attainment on entry of the students in all year groups is identified as Sig- and the college has almost double the national average of SEND students. While historic recruitment challenges are being addressed, the college continues to work hard to overcome the current national recruitment issues. Turbulence in the college is extremely high – in 13/14 the college admitted 68 students as non-standard entries; 14/15 saw that rise to 88 students and 15/16 saw another significant rise to 151 students being admitted as non-standard entries. The majority of these students brought with them significant challenges. The percentage of stability has decreased from 86% to 77% over the 3 years. There has been a significant influx of EAL students over the last 3 years – from 12% of the cohort to 28% of the cohort. Leicester is a multi-racial city and this is a positive aspect that will continue to grow. This has resulted in the college reallocating resources, altering schemes of work and modifying assembly programmes to ensure racial and cultural harmony is maintained. The college has invested in both in and out of school activities and has also developed partnerships with other organisations to offer activities to young people in the area, resulting in a measurable decrease in anti-social behaviour. The college strives to operate as a local employer where possible and has helped local residents back into work through the volunteering programme. The school recognises that social change is a long term incremental strategy. 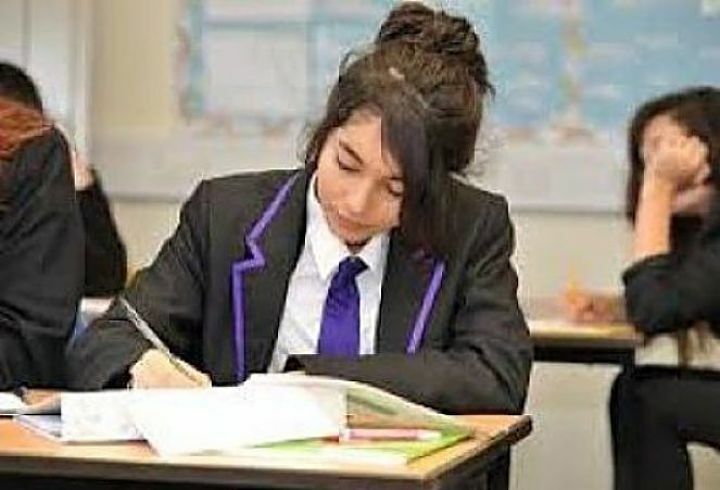 The college website has an informative video introduction to the school which leaves its audience in no doubt that the college strives for “outstanding progress for all” and that stretch and challenge together with a high level of aspiration are key components of the New College ethos and culture. The college has undergone a partial rebuild using BSF funding. This has included the refurbishment of some teaching areas and a new sixth form centre, Community facilities, classrooms and reception area. The ICT infrastructure has also been upgraded together with a substantial hardware investment. The main entrance to the school is modern, bright and welcoming. The reception area and staff offer a very positive first impression of the school. Good quality display boards are available in all areas of the school and contain examples of students’ work, consistent messages about expectations, aspirational images and quotes. Throughout the school, in classrooms and corridors, good quality display was a feature of the college. In a maths classroom, even the ceiling was used to display definitions of mathematical terms! Students understand and know the expectations placed on them with regards to behaviour and achievement. All individuals are valued and this ethos both underpins and pervades the college. ‘YDE accreditation for Ethos’ and OFSTED endorse this view. During my several tours of the college including eating lunch with students in the canteen during both days of the assessment, students’ behaviour was very good and there was a calm, orderly and friendly atmosphere which was a pleasure to experience. The building is well looked after and the almost complete absence of litter during the busy lunch time was testament to the attitudes of students. There were no signs of vandalism or graffiti observed anywhere in the school. Students are aware of the support on offer to them and know who and where to go for help of any kind, academic or pastoral. This was supported by students to whom I spoke during lessons, in the canteen and in my meeting with members of the school council. There is a comprehensive menu of support available for all learners and this is targeted to maximise achievement. Learning is extended beyond the school day with a wide variety of clubs and activities on offer. This includes departmental revision classes and study support during appropriate times of the year. Pupils are encouraged to take part in other activities such as visits and ‘off timetable days’ such as View point days, and community projects. The college has a member of staff responsible for developing this additional provision. The ‘Lead Teacher for Extended Curriculum Opportunities’ carefully monitors participation frequently and regularly. There are very good arrangements for transition from primary school and for in-year admissions of all types. There is very effective transition from KS2 – KS3 through a well-established programme. The Transition Manager arranges visits to feeder primary schools to obtain information about students to enable smooth transition. Additional visits are arranged for vulnerable students alongside Transition Boost Groups to support students. There is a detailed transition programme provided for vulnerable students via the SENCo and Head of Year 7 who is responsible for transition. Students who start school in-year are given support through the Inclusion Team, form tutors and Head of Year. Raising aspiration is clearly a key part of the college’s driving ambition for its students. There is excellent career information, advice and guidance available for students. The college has previously been awarded the prestigious Career Mark and is currently in the process of preparing for reaccreditation. There are good links with business, universities and other organisations including promoting STEM. Examples of activities include: Y8 and STEM, Y9 with KP Food and the Leadership Challenge, Y9&10 exploring the ‘Ladder to Law’. There are well established and positive links with local FE colleges. A notable strength of the college is the detailed, comprehensive and regular student tracking system which collects data five times per year. This also includes the monitoring of student behaviour and achievement. Data is used effectively to influence both the deployment of support and learning approaches. I was provided with a wealth of documentation that evidenced this. Information is shared with students and all are aware of their individual targets for each subject. Parents are informed on a regular basis at parents’ evenings and via interim reports, end of year reports and SEN reviews of their child’s progress. Contact with parents and carers is overtly encouraged initially via the parents’ forum on the website but also through student planners, email, phone, direct face to face meetings and social media (Twitter). The usual programme of parents’ evenings and report cycles enhance this process. The college takes the opportunity at such events to survey parents’ and carers’ views, concerns, thoughts and suggestions for improvement. The most recent surveys show that the vast majority of parents and carers are fully supportive of the college. The Board of Governors of New College have a clear, shared vision for the school and inclusion is at the heart of this. The Governors have clear areas of responsibility and through their link roles are well informed about the school. Governors offer robust challenge and support for senior leaders. Governors are experienced and knowledgeable and have a good understanding of education generally and their school in particular. Governors bring their professional expertise and experience to the college and use it to good effect. Safeguarding is effective and is carefully monitored. The college has a growing commitment to use the community as a learning resource and to offer its facilities for community use. There are very strong links with a number of local sports clubs and the college hosts a wide variety of statutory, commercial and voluntary partners that support the school in its desire to place itself at the heart of the community. Sporting events such as The Special Olympics and the Down Syndrome World Gymnastics Championships have been held at the College. The college works in close partnership with De Montford University. Students from the university support students with academic achievement mentoring; excelling in certain subjects (Maths and Science); attendance mentoring of poor attendees etc.